Yessir, Yessir. 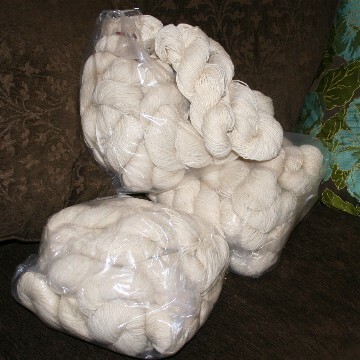 I’ve got three full bags of the most fantastic yarn I have ever touched. I’ve waited several months for this shipment, having found a supplier of American-grown organic merino earlier this summer. This yarn is such a pleasure to knit up and I love the texture of the finished fabric. Three bags! 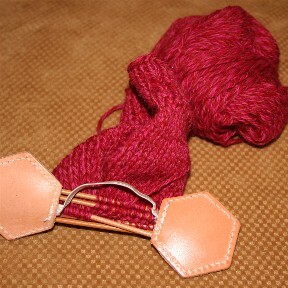 I can’t wait to dye some and start knitting with it. First up will be a vest for Ollie, who keeps asking "please knit me something, Mama." 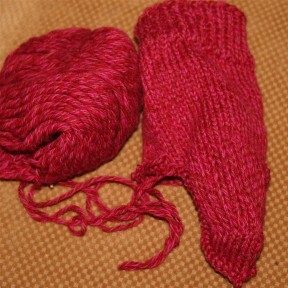 I survived sock trauma and grew and matured as a knitter this week. Really. I don’t know why I thought it was a good idea to take sock #2 of the red Cascade Quattro pair along to my number one son’s play, but I did, and, predictably, I lost some stitches off those tiny little needles. A combination of my ineptitude and bad lighting resulted in a run. A bad one. A small confession here — I am a bad person. The kind who might try to live with an error say 15 rows back or attempt a fakey-looking darn. But I am trying to improve myself and this one really was too bad to live with, so, sitting in Starbucks parking lot yesterday morning, waiting for said son’s return with morning dose of caffeine, I bravely pulled the whole lot off my needles. Then, I found myself wondering, what the heck I was doing sitting in the cramped car with all those tiny stitches pulled off of the needles? Really, it was pre-coffe, but what was I thinking? We made it home, though. A sad sight isn’t it? Into the gusset decreases, and off the needles it goes. Just when I thought I was done frogging, there was still a bit more. (Note the lovely French manicure left over from my TV debut. Since my hands are usually lovely shades of blues and greens from dyeing, this pristine look is new and frankly, unlikely to last). 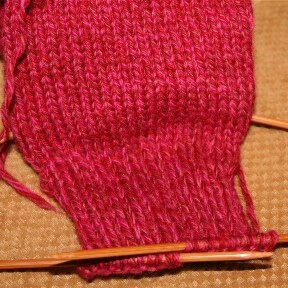 By the time it was fixed, I was all the way back to the end of the heel flap. I was as proud and pleased as a brand new mama to get all the stitches back on the needles, facing the right way. Phew! This whole little misadventure could have been avoided if I had used my sock holders, which I adore, and which I have no idea why I didn’t use in the first place. 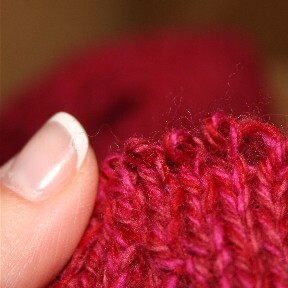 The bottom line here is that this has to be one of the stupidest and easiest to fix knitter-mistakes around. But the prospect of pulling knitting off the needles, frogging, and having it all come back to normal still is enough to give me nightmares, the kind where you wake up in a cold sweat, for days makes me a little bit uncomfortable. I’m feeling proud and accomplished. Knitting seems to do more for my self esteem than just about anything else around. And, thanks to the help of a very congenial group of knitters on lunch hour at Knit Nouveau, everything is back to where it was before and I’m off on the gusset again!